SOTA News January 2018 SOTA Instruments Inc.
One of the many things we are grateful for with SOTA is the opportunity to be a part of something bigger … something more than just our team here in Penticton, Canada. Along with our Customers and our SOTA Retailers & Practitioners around the world, we’re all part of a global wellness community of like-minded people. And that’s pretty cool! 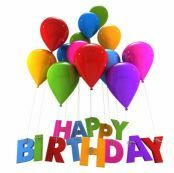 It’s in this spirit that we celebrate our 22nd Birthday. Many of you have been with us on this journey since the beginning, so this is as much your celebration as ours. 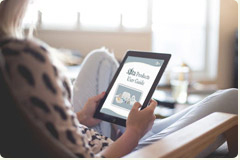 To our newer customers – we are so happy you’ve joined us! Whether you’ve been with us a long time or short, we are grateful to all of you for your trust and confidence. A heartfelt thank you to each of you! As always, Russ has some pretty remarkable projects in development, and we’ll be sharing sneak-peeks from time to time, so stay connected via SOTA eNews and Facebook. Again, thanks for coming along on the journey, and we’ll save you a piece of virtual birthday cake! Getting started with the SOTA products. As with every new endeavor, setting yourself up for success requires preparation. With the SOTA units, this means not only understanding HOW to use the units (our videos at www.sota.com/sota-videos really shorten the learning curve! ), but also developing an awareness and a mindset that will support you in achieving your wellness goals. • While the SOTA units are designed to be used independently, they can also be used together as part of an overall Wellness Lifestyle. When beginning, some individuals find it easier to introduce one unit at a time—allowing the body to adjust before introducing the next unit. Others start all the units at the same time. As with all Wellness Tools, pay attention to what works for you. • Drink plenty of water—especially when Micropulsing. Have a glass of water before, during, and after each session. • When using the SOTA units, listen to your body, pay attention to how you feel. If you are experiencing sluggishness, flu-like symptoms or other minor symptoms showing the body is moving itself towards wellness, reduce the time you are using the unit. Depending on the experience, perhaps take a break for a few days before resuming. The keys are tuning in to your body and consistency of effort. Listen to your body, respect what it’s telling you, and use the feedback. Make adjustments if you need to. The point is not to rush. Increasing the amount of water you drink throughout the day may also be helpful. Remember, a Wellness Lifestyle is not a race—it’s a journey we choose for ourselves each day. • Those who are most successful in achieving their wellness goals have also made other healthy lifestyle choices. Changes to consider are: improving diet, reducing stress, improving elimination, emotional healing, getting moderate exercise, and avoiding environmental toxins such as heavy metals, radiation, molds, chemicals and GMO products. For these tips and more, please check out The SOTA Products User Guide. The SOTA Rubber Probes are infused with graphite, which is a great conductor of electricity due to the mobility of the graphite electrons. Eventually, though, the Rubber Probes need to be replaced. How can you tell when to replace Rubber Probes? Your first clue might be the “feel” of the pulse seems a bit prickly, or you might not feel anything at all. 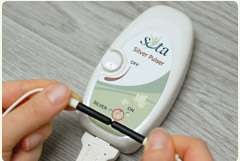 Without applying the Silver Pulser to your wrist, turn it on and adjust the dial to full intensity. Then gently touch the tips of the Rubber Probes together as shown in the photo. The Yellow Micropulsing Light should flash brightly. This test allows you to verify the entire surface of the Rubber Probes is active and conductive. If the Yellow Light is dim or not visible at all, it’s time to replace the Rubber Probes. Our technician recommends this test at least every 2-3 months, or if you notice a change in how you feel the pulse. New Rubber Probes are available for purchase at our website www.sota.com or by contacting our Customer Care Team. Just give us a call at 1.250.770.2023 or 1.800.224.0242 (toll-free in Canada & USA). We're open Monday-Friday, 8AM-4PM Pacific time. Are you wondering if making 2 cups (500 ml) of Ionic~Colloidal Silver at a time is your only option? Nope! Larger quantities are indeed possible. In this 1.5 minute video clip, Russ discusses what’s involved in preparing larger quantities of Ionic~Colloidal Silver. You can also find specific recommendations in your Silver Pulser Product Manual (available at www.sota.com/manuals/). Interested in more info—and how PPM is impacted with larger quantities? 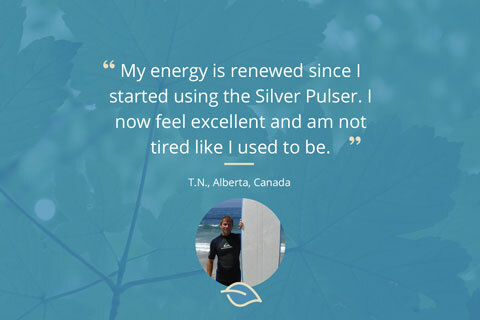 Check this out: How to Make Ionic~Colloidal Silver with the Silver Pulser. 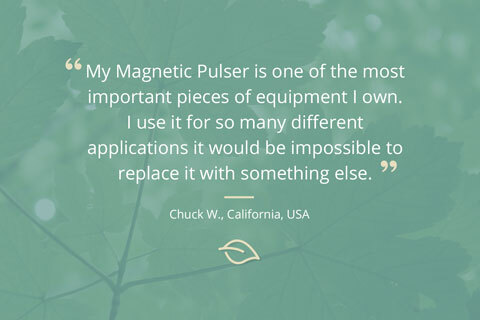 “Get a Grip!” on your Magnetic Pulser! Based on customer feedback, we’ve been on a mission to find a way to make the Hand Paddle easier to grasp. After exploring many options, we’re happy to announce we have a suggestion to recommend (and one that’s cost-effective and fun, too!). Simply take about 14 inches (~35 cm) of athletic sports wrap and wrap it around the handle of the paddle. This provides a slightly cushioned surface that is easier to grip. It sticks only to itself, has no residue and isn’t sticky like regular tape. 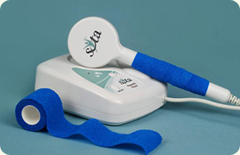 Also known as self adherent wrap and stretch athletic tape, it’s available anywhere that sells first aid supplies. The fun part? It comes in a rainbow of colors and patterns; even holiday-themes!